Last spring, the Educational Theatre Association (EdTA) selected 12, two-member teams for its Model Curriculum Framework Project. Golda Och Academy’s Upper School Dean of Students and Arts Department Chair Jordan Herskowitz was chosen out of the more than 100 applicants for this prestigious program, which is supported by a grant from the National Endowment for the Arts. The two-member teams consist of high school theatre educators and teaching artists from across the country who will create a high school curriculum framework and a series of standards-based instructional units in targeted areas of theatre. Mr. Herskowitz has been paired with NYC teaching artist Brian Curl for the musical theatre unit. In July, teams met for a three-day professional development symposium in Cincinnati where they collaborated and worked alongside EdTA national staff. Mr. Herskowitz and Mr. Curl then implemented a unit at Golda Och Academy at the beginning of the school year called Finding the Meaning Behind the Movement to discover what drives a character to move onstage. Eleven high school students were selected to participate in this pilot program which met over the course of five after-school sessions. 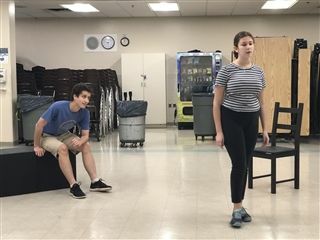 “The workshop provided me focus as an actor and gave me examples of what I can do better to improve my acting to expand myself,” said Golda Och Academy sophomore Gabi Weiss. Students explored character movement and workshopped a solo or duet song from a musical theatre piece. Additionally, participants were filmed during the workshops and interviewed about their experience in the program for Mr. Herskowitz and Mr. Curl to submit their findings. EdTA staff member Ken Bolinsky also came to observe and provide feedback. Senior Amanda Feldman said prior to the workshop, she was afraid to test her emotional range as an actor. “Once we started the workshop, it helped me to commit to my acting choices. Now, I feel more confident in the characters I play." Select Golda Och Academy high school students participated in a musical theatre workshop for the Educational Theatre Association’s Model Curriculum Framework Project. 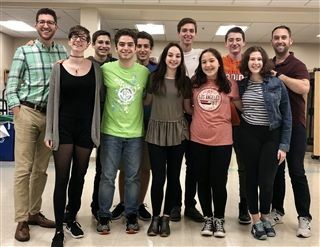 From left to right: GOA Upper School Dean of Students and Arts Department Chair Jordan Herskowitz, Samantha Bates, Amitai Nelkin, Gabi Weiss, Theo Deitz-Green, Amanda Feldman, Itai Rekem, Naomi Sessler, Rafi Colton-Max, Hannah Stoch and NYC teaching artist Brian Curl. GOA Students met during five, after-school sessions to explore what drives a character to move onstage.